Being created by a small Croatian developer, Legend of Crystal Valley showed up at our door without much publicity. From the outside, it looks like many adventure games you may have played before. 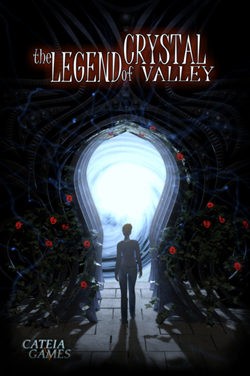 It is set in a fantasy world that is connected to ours by hidden portals, and the main character starts a quest in an attempt to find her father. Once you dig in however, what you discover is a formidable product that is, quite frankly, one of the best games I have played this year. Are you getting excited yet? Read on to see if this is the kind of game that could tickle your fancy as much as it did mine. You play as Eve, a woman who has been growing apart from her dad, Ian, after her mother died in an accident years ago. One day, Eve receives a letter from Ian that contains some very alarming thoughts. The letter asks her to come to the family estate so he can see her one last time. Eve obliges, discovers that her father has disappeared and follows the trail that leads her into a different realm. 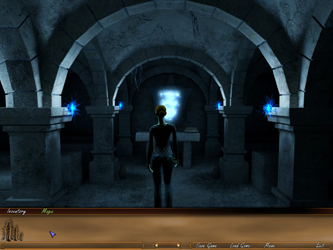 As you can see, the plot follows some of the clichés of the fantasy genre, such as the mysterious other world which can be accessed by a portal. While I cannot give good grades to a game that employs a synopsis we all have seen so often before, I can say that the way the plot is carried out as well as the dialogues more than make up for the weak premise. Not only are there some clever twists and turns along the way, but there is also a lot of humour to be found through the game. It ranges from genuinely funny banters from some of the characters (like a fat, drunken elf) to simple references when examining objects. For example, when Eve examines a bell, the description says “Yo Ding Dong, Ding Dong Yo!”, instantly making Weird Al fans the world over chuckle. Yes, The Legend of Crystal Valley features a tired premise, but it successfully builds on it to make it the final package both entertaining and satisfying. I must admit that I was impressed by the graphics at first. The game starts with a nice intro that features cartoonish graphics with a grainy filter that fits perfectly with the eerie mood of the scene. It’s almost like a Pixar movie. If I were to judge the visuals on that single scene, I would have to give the game a perfect score in this category as I was seriously in love with the style displayed. The problem is that the rest of the game doesn’t follow suit. The in-game graphics are a mixed bag. The backgrounds are beautiful and looks as good as anything I have seen in other games of the genre. 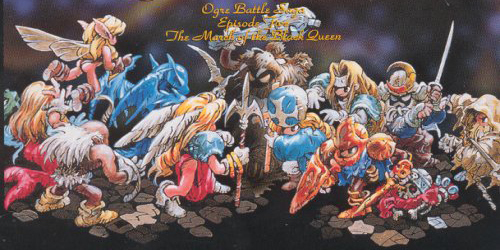 The issue is that the characters are crude 3-D models which look like they are straight from the late 90’s. The way they interact with the backgrounds looks like a bad Photoshop job, as they never really seem to be a part of the same world. The difference in quality between the two is like day and night, which, granted, does not affect gameplay at all, but still is an eyesore. There are several other anomalies which plague the game: things like flames not moving at all or clipping issues when picking up objects means that this game is not always pretty to look at. Furthermore, most of the animations, even simple ones like walking or turning around, look extremely unnatural. On the good side, the whole interface is clean, minimalist and generally well-designed. It is far from being the ugliest game out there, but some of the problems are hard to forgive when so many similar games manage to look so much better. The music here is surprisingly good. While it is the usual classical-sounding, ambient tracks that we have come to expect from fantasy-themed entertainment, it is done so well that I have absolutely nothing bad to say about it. From start to finish, the game is filled with great pieces that set the mood for the different scenes. It becomes darker when you are inside a cave, it’s quieter inside of buildings and it even sounds somewhat epic when you are out in the open. It fits with whatever is going on in the game and it is remarkable without being too loud. The sound effects are also very competent, even though they are sometimes off by a second or two. Otherwise, everything sounds like you would expect it to, from cutting a rope to opening a door. One thing that needs to be known is that the game does not have voice acting outside of the introduction sequence. The rest of the dialogue is conveyed via subtitles. This is probably due to budget constraints, but honestly, it does not really take away from the game at all. I will gladly take good writing over badly done voice acting any day of the week. Let’s start with the basics: an adventure game is all about clicking and pointing. Thankfully, these two functions work perfectly and I have not encountered a single glitch in that department during my play through. The cursor changes shape or colour to tell you exactly what’s going to happen should you choose to click there. Green means that the item can be picked up, yellow means that Eve can walk to that place while blue indicates a change of scenery. If you can only examine an item without picking it up, the cursor becomes a magnifying glass. The system is very intuitive and feels like second nature after only a couple of minutes. The interface is also very clear and easy to use. It’s nothing but a small band at the bottom of the screen, with three different tabs to navigate between the different parts of your inventory, such as objects or magic skills. It’s never too cluttered or in the way, and it can be summoned or dismissed with a simple right-click of the mouse. The game is chooses wisely to focus on the story instead of coming up with contrived solutions to puzzles that made no sense in the first place. Everything you will need along the way can be picked up as soon as you find it, so the game is light on backtracking as long as you click and examine every single thing on every screen. This is made easy by having huge clicking areas even for small objects and by having the cursor change color to indicate that you have just passed it over something with which you can interact. This saves a lot of headaches as each puzzle can be solved by simply exploring your inventory and thinking of how it could be useful in the area. This doesn’t mean that the puzzles are overly simple of boring however, but I will have more details on this in the “balance” section of this review. My only issue with the gameplay is a simple one, but it does get annoying after a couple of hours. Eve, the game’s protagonist, has only two speeds when walking, and it is “snail stuck in cold molasses while trying to pull a dead turtle out of cement” or “comically fast Benny Hill pursuit” speed. Sure, the game lets you skip the long walking animation by double-clicking if you have visited the screen you want to go to at least once, but it still means that you have to witness Eve making her way through hundreds of screen. The comical speed is almost an entertainment by itself, but it gets old after a while. Seriously, if the double-click screen jumping option was activated from the start, the game would lose about an hour in length. Otherwise, I don’t have any complaint in this department. The game is a joy to play from start to finish, as the whole game goes on without a single hiccup. As with most adventure games, this is the weak point of The Legend of Crystal Valley. It takes about six hours to beat, and even though the time spent with the game is a fun one, there’s no real reason to play it again. Thankfully, at 20 dollars, there are worse deals out there. As I said before, the puzzles are simplistic in their composition, but still manage to be clever. How is that possible? First, everything you will ever need to solve a puzzle will probably already be in your inventory by the time you need it. 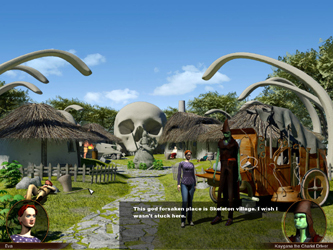 However, the game maintains a challenge by keeping each item’s utility a mystery until the last minute. 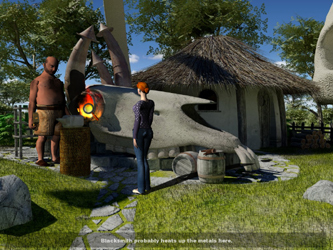 For example, near the start of the game, you will pick up a poem and a collection of statue. Both look inoffensive on their own, until you realize that each statue plays a role in the poem, which indicates what you need to do with them. Don’t worry, this is not a huge spoiler, but merely something which I chose an as example because it happens early in the game. Some of the items can also be combined to make a new one, so if you ever feel stuck, you can always check your inventory to see if there’s anything you can build to get out of the situation. The challenge is pretty straight all the way through: things that you learn at the start of the game will become useful as you progress, and there’s nothing that seems to come out of the blue. As long as you pay attention to what you are doing and things that characters are saying, you will do just fine. Of course, this is a text-heavy adventure game, so you might want to take some notes along the way I tip my hat to the developers for the continuity from chapter to chapter. The puzzles they designed are very enjoyable. The story of another world being hidden from our eyes but which can be accessed by a special portal has been done quite often in a lot of different mediums (The Chronicles of Narnia immediately comes to mind). The fantasy setting is nothing special, but the way the story is carried out takes some turns which are unusual for something from this genre. The characters are charming and bring some life into what I thought would be a tired story. Yes, a lot of it has been done before, but at least it is done right here. When everything comes together like this to create a fun and stimulating experience, it is understandably hard to put down. The flow of the game is masterfully paced, so you never get tired of playing and time just seems to fly by. It’s just a shame that the game is over so quickly. Adventure games are a very niche genre, but The Legend of Crystal Valley could actually pull in more gamers because of its fantasy setting. The fact that originality is the game’s weak point could actually work in its favour because the developers at least at the sense to take the good things from the sources it tried to pay homage to. This is a game that doesn’t require a monstrous set-up to run properly, so it can be enjoyed by anyone with a PC that is about five years old or more recent. Combined with the budget price tag, there’s no reason anybody interested in adventure or fantasy games should be skipping this one. I had a great time playing The Legend of Crystal Valley. Sure, it’s a short romp, but you won’t regret the time spent playing. I have to give props to the Cateia Games developers for coming up with such a good product with such a small team, as everything I have seen shows that a lot of efforts went into the product. Despite some technical shortcomings, the game is still a joy from start to finish, so all I can do is give it my highest recommendations. I have to say that I enjoyed this game. But, the ending was extrememly disappointing. I was hoping for a more “resolved” explanation rather than the picture of the perfect family. Issac was seen as a bad man in his world… Didn’t Eve want to question him about that? Does she actually take over for him? I’m really hoping that there will be a sequel. I am having trouble getting out of the room above with the lights. I have given the witch the 3 flowers, and I keep going to the cyprt, but I can’t figure out how to open the stone wall all the way to get to the portal the witch told me about. You have to make sure you drink the shrinking potion the witch gives you for taking the flower book to the flower shop. It should be under the ‘magic potion’ tab in your inventory, click on it twice. Hope this helps. Deon- I want to add by drinking the shrinking potion, this will enable you to walk under the door to get to the portal. Don’t drink it until you are in front of that door. To reverse it, all you have to do is click on yourself a couple times once you’re in the portal chambers.